So sad you can't get Chick-fil-A on Sundays. You can make your own Chick-fil-A inspired chicken at home, ya know. True story: I used to work for Chick-fil-A. I was a marketing director. I helped plan those fun dinners, events, and sampling. And no--I never dressed up in the cow costume. That privilege was reserved for very enthusiastic, tall, thin, teenagers. Every location has a marketing director. The best perk: Having Chick-fil-A every day for lunch. Nuggets, strips, waffle fries, salads, cole slaw, wraps, lemonade... man, it was the best! And for breakfast? The ubiquitous chicken biscuit. I'd clock in, grab a biscuit (with no butter brushed on top, that's what makes the biscuit taste so good) and start my day while munching on one. McDonalds has one--no, two actually, and neither of those are as good as these. 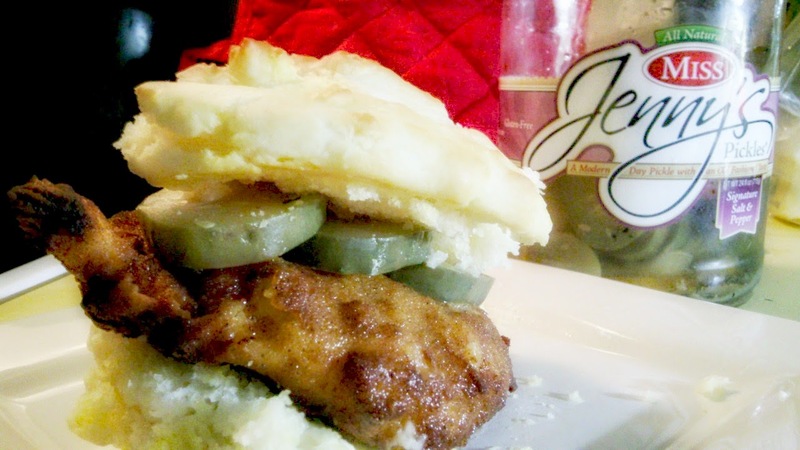 So, my Southern Style Chicken Biscuit is special because it's accented with local pickles made by Miss Jenny's Pickles. North Carolina is known for a few things: Pepsi, sweet potatoes, Krispy Kreme Doughnuts, Texas Pete hot sauce, Mt. Olive Pickles and Miss Jenny's Pickles. Jenny and her business partner, Ashlee, left their jobs in corporate America to embark on this business venture. Their story is amazing and so are their pickles. My favorite are the bread and butter habanero pickles. They are the spiciest things! The only thing more amazing than their signature salt and pepper pickles is this chicken I'm about to tell you how to make. It's a must have. Really, it is. As for the biscuit part, I've more biscuit recipes on this blog than anything else. You can pick one. Or find your own. Place chicken breasts in a reusable container, bowl with a lid or resealable plastic bag and add pickle brine. Refrigerate for at least 30 minutes, up to 8 hours. Meanwhile, combine paprika, black pepper, garlic powder, onion powder, cornstarch, powdered sugar and flour, in a medium-sized bowl. Set aside. Whisk together milk and eggs in a second medium-sized bowl. Set aside. In a large cast iron skillet, deep fryer, or Dutch oven, preheat oil to 350°F. Remove chicken breasts from brine and pat dry with paper towels. Season on all sides with salt and pepper. Dredge each breast cutlet in the milk mixture and turn to coat. Dredge each cutlet, one at a time, then dredge each piece in the flour mixture. Pile extra flour mixture on top of cutlet, and press down firmly to adhere as much mixture as possible to the meat. Lift cutlet, shake off excess flour, then lower into hot oil. Repeat with remaining cutlets. 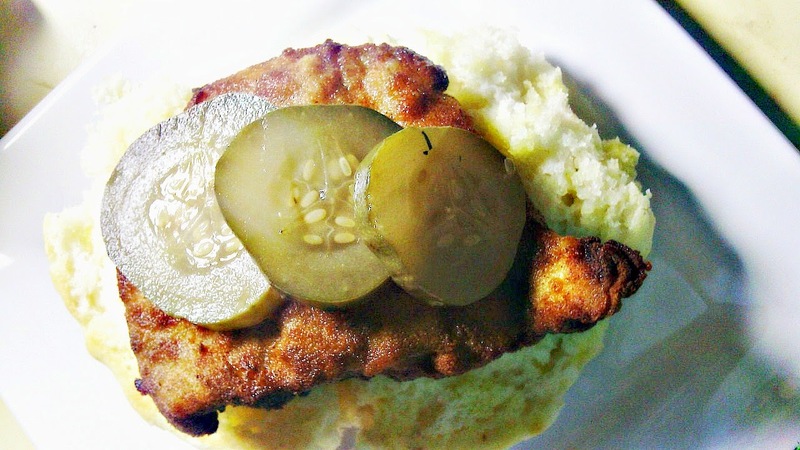 Place fried chicken cutlet on bottom half of sliced biscuit. Top with pickles and place top biscuit half on pickles. Serve immediately. I really like pickles. I always add extra. Oh snap! I WANT THAT. And also? I used to work at Dominoes. Trade you pizza for one of these sandwiches! This looks ridiculously good - I want to start AND end my day with it. And those pickles sound crazy good, too! As soon as I saw the first picture, I thought man that looks like a Chick-fil-A sandwich! Then I read the first paragraph! Looks amazing! So tell me, why did the chick-fil-a craving always happen on Sundays? I certainly wish I had this recipe back in the day. I have it now, so all is good! I've never eaten Chik-Fil-A !! I feel so deprived! Now I have the recipes, so um... Yeah - Chik-Fil-A(ish) for me!! Those pickles sound amazing! I need this, I want this, I must have this. I am so craving fried chicken lately and this post is just making it harder for me to pass on making your recipe. I will be trying this today. I need it! Can't go wrong with fried chicken and a biscuit! I just want to jump into that gorgeous photo and grab it!